Please call the Parish Office (859-331-4302) to schedule a Baptism. Baptisms are celebrated on the first and third Sundays following the 11:30 a.m. Mass or by request during the 4:00 p.m. Mass on Saturdays. Parents must be registered in the parish and are required to attend Baptism preparation classes which are held on the first Tuesday of every month in the Blees Center at 7:30 p.m. It is advisable to attend these classes prior to the birth of the child. 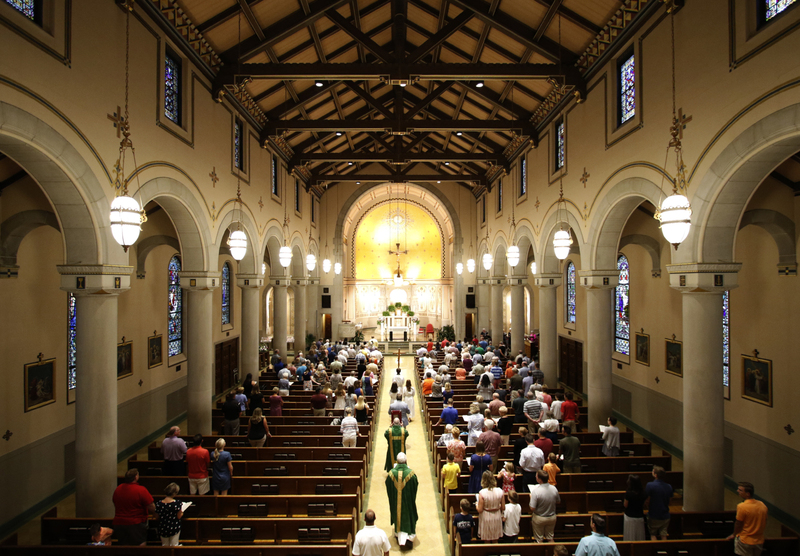 To be married at Blessed Sacrament Church, at least one party must be a registered parishioner. Couples are required to meet with a parish priest or deacon to discuss marriage preparation. Please call the parish office at least six months in advance to reserve the church. Music Director, Matt Spencer, is available to help plan your ceremony’s music and should be contacted separately to make arrangements. To see all dates and activities pertaining to first reconciliation 2018, click HERE. To see all dates and activities pertaining to first Holy Communion 2019, click HERE. For details of Sacramental celebration at Blessed Sacrament, click HERE. If you are a Catholic adult seeking to celebrate sacraments you missed as a child or a non-Catholic interested in learning about the faith or joining the Church, click HERE.